Emails are great way to convince a person to be interested in your product. Effective and easy to use. It is one of the most important marketing tools for website promotions. The best part of emails is it is very cost efficient. So sending a good looking emails creates an impressive impression. A good template is responsive, modern and clean. It creates a long lasting impressive impression on the viewer. More clients are the result. As a result a good marketing strategies. 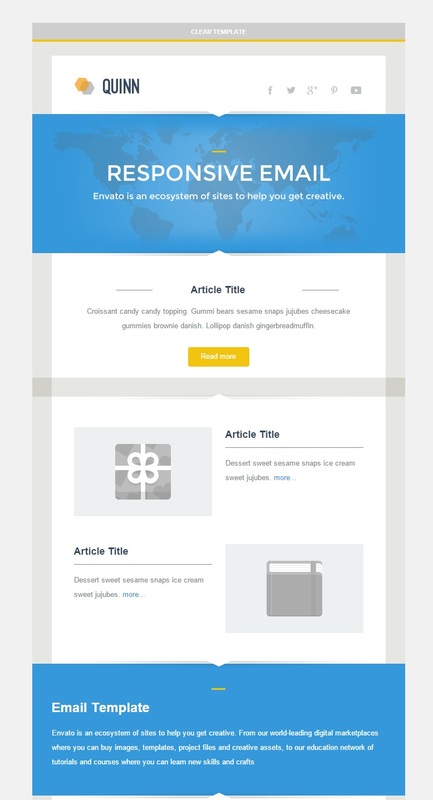 For this purpose we are sharing you the list of best newsletter email templates . Just use one of these templates to make an exciting newsletter. Zooey is a responsive email template . This creative template has a vintage design. It is a clean, neat gorgeous looking template. Which makes it ideal to promote any type of business- Corporate, Creative agencies, bloggers, photography site, freelance designers etc. It has drag and drop feature. All important famous email clients – yahoo mail, gmail, apple mail etc are supported. Perfect for promotions. 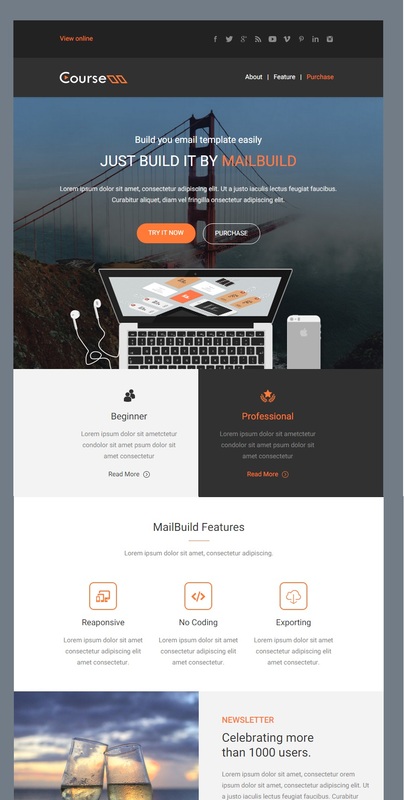 Multimail is a responsive email template set. This is a premium template with a clean design. It has six templates and hundred modules. You have the option of drag and drop. Easy to customize with lot of variations. The template is compatible with major email marketing solutions like mail chimp, campaign monitor, fresh mail, mailbuild builder etc. It is easy to change , delete or insert images. It is bundled with plenty of options and features. All I would say this template turns out to be good marketing strategy. Elena is a responsive email template. It is compatible with major email clients and email solutions – mailchimp, freshmail, campaign monitor, awber etc. Features include drag and drop builder. Comes with unlimited variations and colors. Elena has layered psd files. Fountain is a responsive newsletter email template. The design is clean, beautiful and modern. Fountain is compatible email clients like Apple mail, Hotmail, Gmail, Outlook, AOL mail etc. It is compatible with email soluutions – awber, mailchimp, icontact etc. You have unlimited color options. The background image can be changed. It includes forty modules that can be dragged. There is drag and drop builder. Omail is a multipurpose responsive email template set. It can be used as marketing tool for various types of organizations like business, software, portfolio, personal website, ecommerce, travel, event, creative agencies etc. There are 20 email templates with unlimited variations. It includes 2o0 email modules. Omail has mastermail builder to edit the mail templates as per your needs. There is unlimited color variations. Other templates included in the package are MailChimp template, Campaign Monitor template. The templates are HTML compatible. Omail is compatible with famous email marketing solutions like MailChimp, Campaign Monitor, Aweber, Freshmail, GetResponse, iContact and constant contact. This template is also compatible for major email clients like AOL mail, Apple mail, Hotmail, Opera mail, Yahoo mail, Gmail etc. Interim is a responsive multipurpose email template set. The template can be used by various types of businesses like fashion, portfolio, real estate, restuarant, creative agencies, designers etc. It includes 300+ awesome design blocks. Interim has a email builder to customize the designs. There are 100 individual modules which can be modified to build up your unique email template design. The package also provides email icon generator to make icons suitable for your business. With page and drop builder in this template package you can customize colors, layouts, background images, text styles etc. It is easy to use. The designs are modern, clean, sleek and elegant. 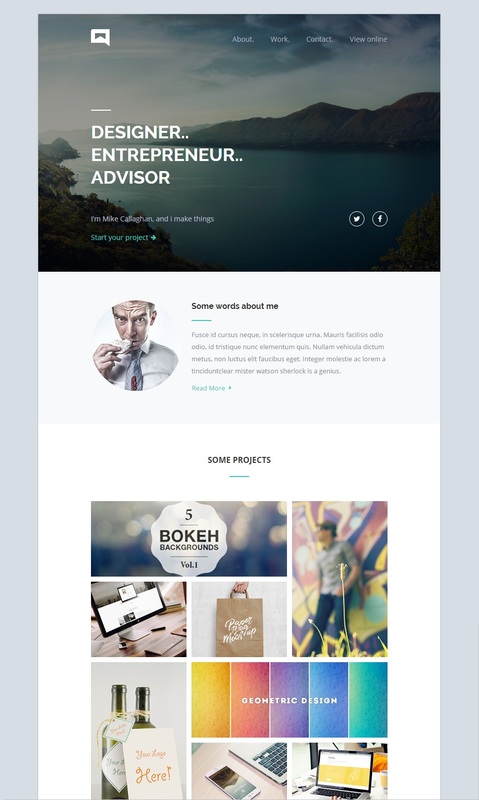 Interim email template is compatible with MailChimp, Campaign Monitor and HTML. It includes 6 months of customer support. Interim is compatible with major email management systems like MailChimp, Campaign Monitor, iContact, My Mail, Bronto etc. This email template supports major email clients like Gmail, Yahoo Mail, Aol Mail, Apple mail, Opera mail etc. Magma is a clean responsive email template. The template is bright and retina ready. You can use these templates for MailChimp, Campaign Monitor and HTML5 . The package includes thirty five modules. 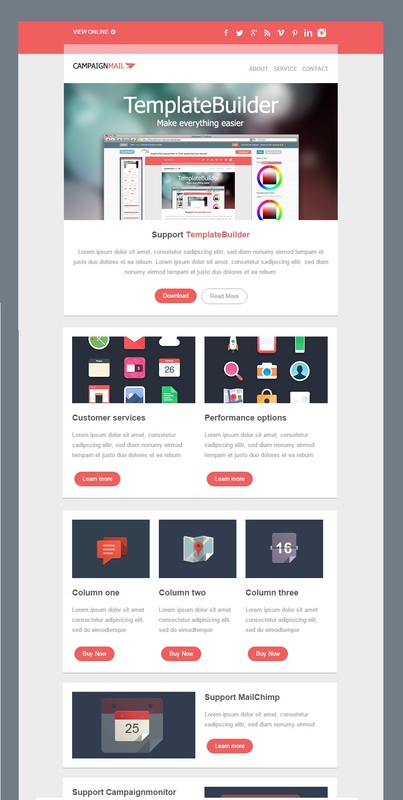 There is an email builder to customize the template and create a unique design. Images , background images , buttons etc can all be customized. Magma is compatible with major email clients like Hotmail, AOL Mail, Apple Mail, Yahoo Mail , Lotus Note 8.5 etc. Business like ecommerce, creative agencies, magazine blogs, personal blogs can use this template to promote their work. Atellar is a responsive email template. The design is neat, clean and modern. It has unlimited color options, drag and drop feature. This premium template is ideal for creative agency, selling services, website developers, promoting apps, showcasing portfolios etc. Atellar is compatible with Campaign Monitor, MailChimp, StampReady. The template is compatible with most modern email clients- Hotmail, AOL Mail, Gmail, Apple Mail, Yahoo Mail, Opera Mail, Mozilla Thunderbird etc. Miaghi is a professional creative responsive email template. The template is multipurpose. It can be used for promoting businesses like agency , events, ecommerce, hosting, real estate, app promotions etc. There are more 230 amzing design blocks. There are endless customization options. It has drag and drop builder. With this builder you can customize fonts, colors, icons, background images etc. The package includes icon generator to generate your desired icon. Matah is a responsive email template. You get lot of options with this template set. There are total of 36 templates which have 16 style templates + 14 notification templates and 6 premade templates. You get more than 75 modules. It is compatible with MailChimp, Campaign Monitor and Mymail. It includes layered psd files which are easily editable. It has a HTML files that can be used for StampReady services. To edit the template either you use photoshop or StampReady Services. Sketch is a multipurpose responsive template. The design is clean, modern and elegant. It has a drag and drop builder. The builder is online where you edit the template and then download the file. The format of template is HTML5 which makes it compatible with major email clients- Hotmail, Yahoo Mail, AOL mail, Apple mail etc. It supports email management systems – MailChimp & Campaign Monitor. 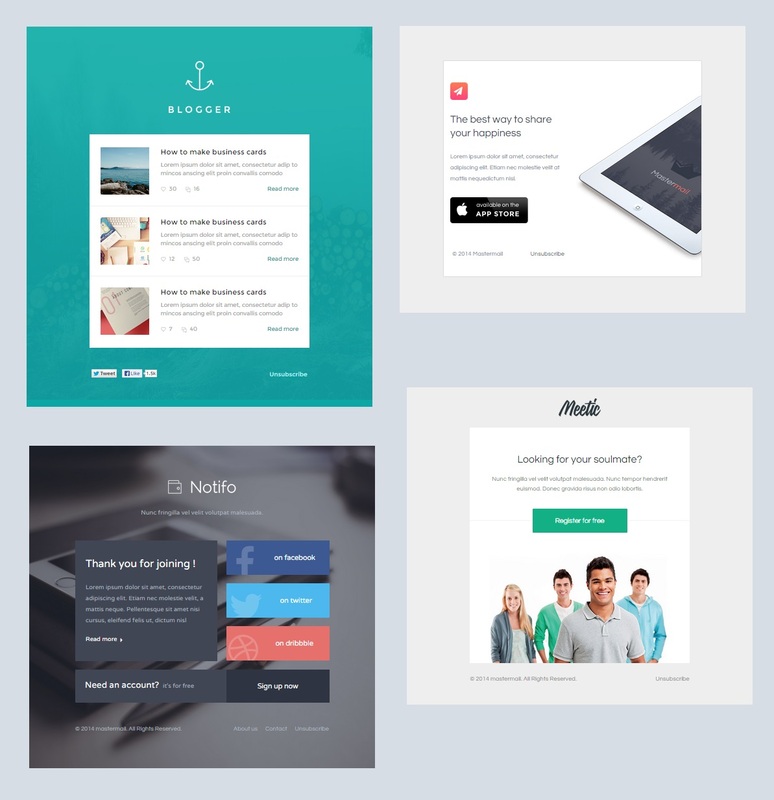 Batch1 is a set of 20 responsive email templates. These templates are edited by the provided themebuilder. You can customize the background images, colors, structures, patterns etc. All this is easy with the drap and drop module. 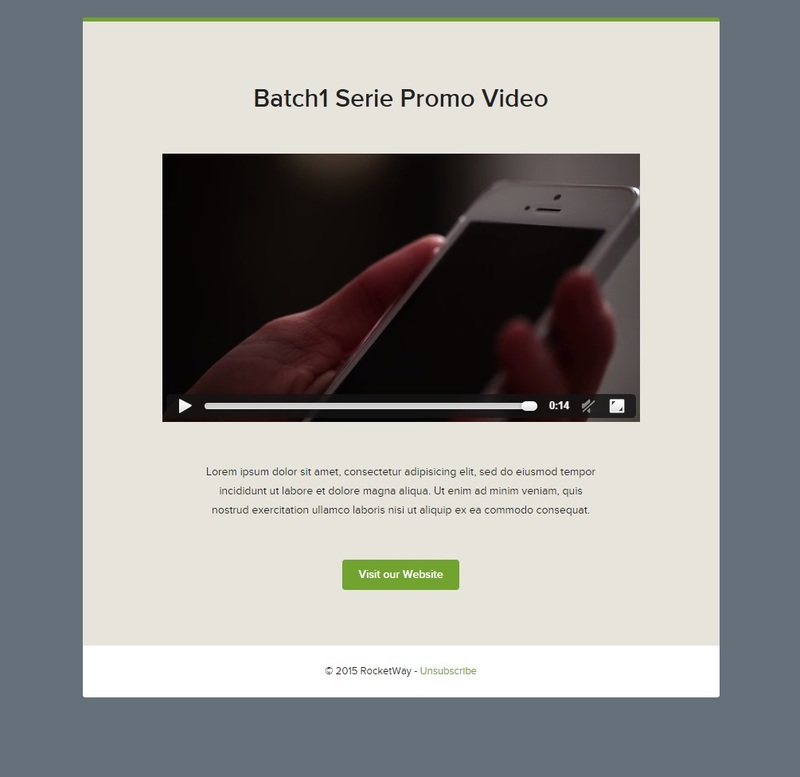 The best thing about Batch1 in one of the template you can even send a video mail. This is encoded in HTML5. Premium font Proxima Nova is used in email templates. Template set are compatible with email management services like MailChimp, iContact, Campaign Monitor etc. There is great browser compatibility with email clients like Gmail, Yahoo Mail, FoxMail, Opera Mail etc. Below is the screen shot of video email template. Check other demo’s by clicking demo button below. BlauMail is a modern responsive email template. The style is simple, flexible and compact. You have the option of five main colors with each having three background samples and two corner styles. Blaumail supports email management services – MailChimp, StampReady and Campaign Monitor. With StampReady you can easily edit the template online. It is also compatible among web based email clients, mobiles and desktops. Skyline is a responsive email template. The template is include template builder to easily edit the design. You can drag and drop to add or delete the elements. The best thing about the template is that it contains lot of options like – nine layouts, twelve color variations, twenty seven elements, 432 HTML files etc. These twenty seven elements make more than 10 lakh variations. This is the best part about Skyline – endless variations to select and create. The template supports MailChimp & Campaign monitor. Skyline is compatible with most famous email clients like AOL Mail, Yahoo Mail, Thunderbird, Apple Mail etc. 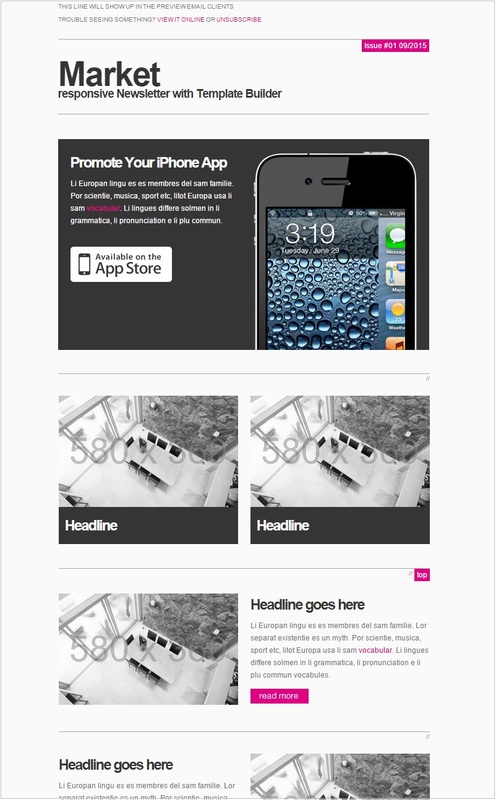 CampaignMail is a responsive email template. The design is clean, modern and colorful. There are twenty four modules &120 various HTML files. Unlimited colors and layouts. You can edit the template by MailBuild Builder. The elements are edited by drag and drop feature. It includes Psd layered files. You can edit text via WYSIWYG editor. CampaignMail is compatible with email marketing services like MailChimp, Campaign Monitor, iContact, FreshMail, Constant Contact etc. There is browser compatibility with major email clients – Yahoo Mail, Andriod, Hotmail, Gmail, Opera Mail, Apple Mail, iPad etc. ProductMail is a responsive email template. The design is clean, crisp, colorful and yet elegant. You can make unique customized layouts via MailBuild Builder. Drag and drop modules. There to 24 modules to select. Edit text in WYSIWYG editor. Change color, remove or change background. Below is the video demo as how to this template can be edited by MailBuilds. ProductMail is compatible with MailChimp, MailBuilds, iContact, FreshMail,StampReady and Campaign Monitor. Its supports most email clients – Hotmail, Apple Mail, Gmail, Android etc. 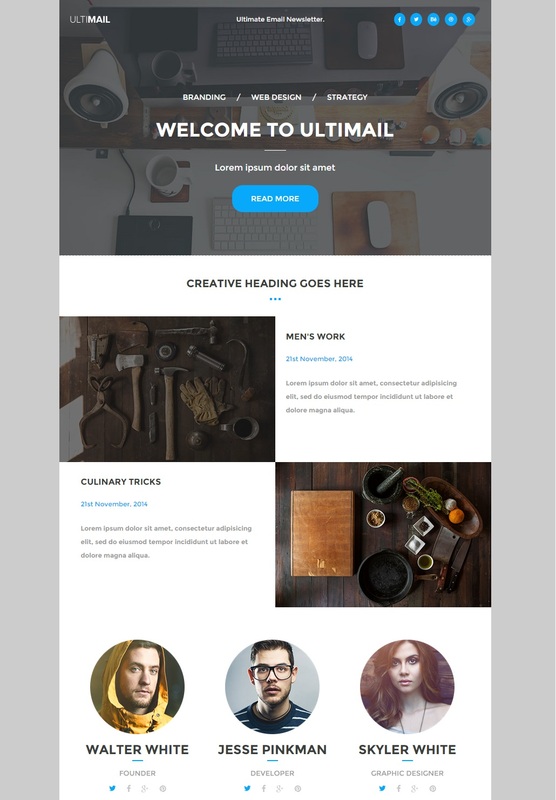 Ultimail is a multipurpose responsive email template. The template is amazingly flexible as it has over 300 design blocks. There are more that twenty four layouts to make your customized template.The template is edited by template builder. The design of the template is clean , minimalist and modern. Ultimail works perfectly with email service provider – iContact, Bronto, MailChimp, Campaign Monitor, Listrak, My Mail etc. It is compatible with major email clients – Gmail, Hotmail, AOL Mail, Sparrow, Opera Mail, Apple Mail etc. Hogar is a responsive email template set. There are 18 styles of template with 12 main and 6 notification types. There are more than seventy modules. You can customize the template by template builder. The template is compatible with Freshmail, MailChimp, StampReady, My Mail & Campaign Monitor. The table structure is easily editable. AgenceUs is a responsive email template. The template is ideal for service businesses like web design, architecture, interior decorators, freelance designers, advertising etc. The design is modern, stylish and clean design. The template is editable by StampReady template builder. There is a chart bar module. The modules are editable by drag and drop feature. It is compatible with MailChimp, Campaign Monitor & Stamp Ready. AgenceUs is compatible with major email clients and browsers. SimpleApp is a responsive email notification templates. It has a fourteen templates covering topics like – activation of services, subscription payments by clients, renew subscription of services, adding new features, sending a message, conversation between the clients, invoices, order confirmation , anniversary, statistics, update of user agreement , customer support and normal text mail. Apart from these there are Shopify templates also deal with custom account activation, order cancellation, shipping update, notify gift card, etc. All that is needed by eCommerce firm. Well there is more to offer. You can build 4 types of customized templates for content, Invoice , Order and Pricing by StampReady Builder. SimpleApp is great package for those in product/service selling businesses. The best part of SimpleApp is that it is compact, neat and minimalist. You can customize the colors and styles. There are 3 layout options to select – Compact, Full and Minimal. It is also compatible with MailChimp and Compaign Monitor. There is a compatibility between email clients ranging from desktop, mobile to web based. MetroMail is a multipurpose responsive email template. The design is clean, elegant minimum and modern. MetroMail contains 192 HTML templates, 8 template layouts, 8 color options, 8 PSD files that are layered etc. The template design can be edited by email builder provided in the package. Use drag and drop to make unlimited layout variations. You can use MetroMail templates on email marketing services like MailChimp, Aweber,Campaign Monitor etc. The templates are compatible with major email clients. 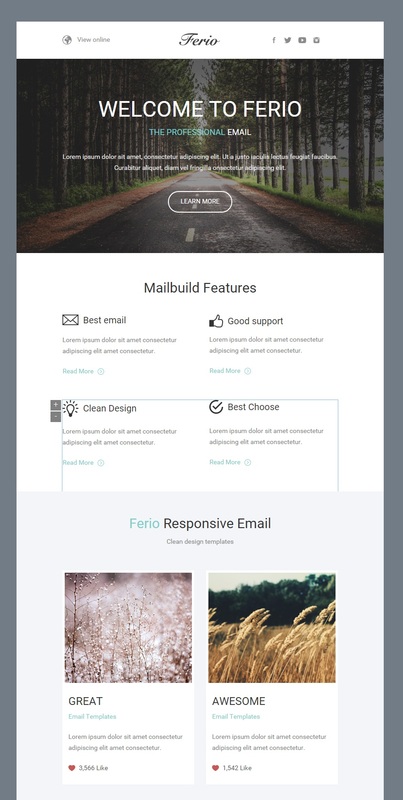 Ferio is a responsive email template. It has twenty two modules to customize your design. You can use drag and drop feature to add or delete modules. You can edit the template via MailBuilder Access. Photos can be added/deleted , text can be edited in WYSIWYG editor, background images can be edited etc. The final edited template can be saved, exported to your PC as HTML file/MailChimp File/ Campaign Monitor. The templates are compatible with various email marketing services – MailChimp,iContant,Contant Contact Campaign Monitor, Freshmail, MailBuilds etc. Ferio is email browser compatible – Desktop clients, Mobile Clients & Web based Clients. This premium template include layered PSD files that you can edit in Photoshop. Alerata is a responsive email notification template set. It has 21 beautifully designed templates. These templates deals with different actions like Login details, Confirming subscription, password reset, notifications, company service promotions etc. These templates are edited by the online editor Mastermail. You can edit, delete, remove images, texts etc. Alerta is compatible with email service providers- MailChimp, Aweber, Campaign Monitor, iContact etc. It supports various email client. The package contains 21 compatible files each for MailChimp, Campaign Monitor, HTML and PSD layered file. Below is the screen shot of 4 templates of Alerta. 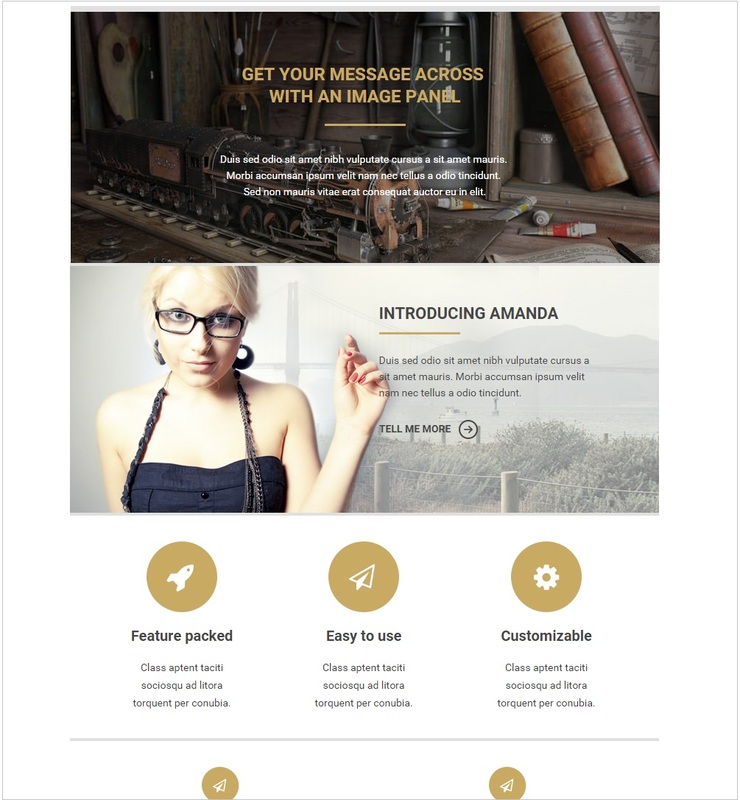 Avana is a clean responsive email template. The template has a awesome colorful modern design. There are 23 various modules. Customize the temple by using MailBuild Builder (Template Builder). You can create unlimited layouts by drag and drop modular. One can remove, change images, buttons, background images and edit text in WYSIWYG editor. Color of the template can be changed as per your likes. The email templates are compatible with various email marketing services like StampReady, FreshMail, MailChimp, Campaign Monitor etc. Avana is compatible in various browser platforms- Web based email clients, Mobile email clients and desktop email clients. Market is a responsive newsletter email template. This template has recorded highest sales at themeforest.net. The design of the template is simple, clean and minimalist. You can choose a layout style from 8 layout options with a color from 24 color options. One can add delete different elements from available 28 elements by using Template Builder 2. This builder is included in the package. It also includes 768 HTML files, 24 layered PSD and PNG files. The option of drag and drop helps you in modifying layout as per your desire. Market is compatible with email marketing services- MailChimp, Campaign Monitor, MyMail etc. There is a browser compatibly among various email clients- Hotmail, Gmail, Aol Mail, Apple Mail, Android, iPad, iPhone, Opera Mail, Yahoo Mail, Outlook etc. 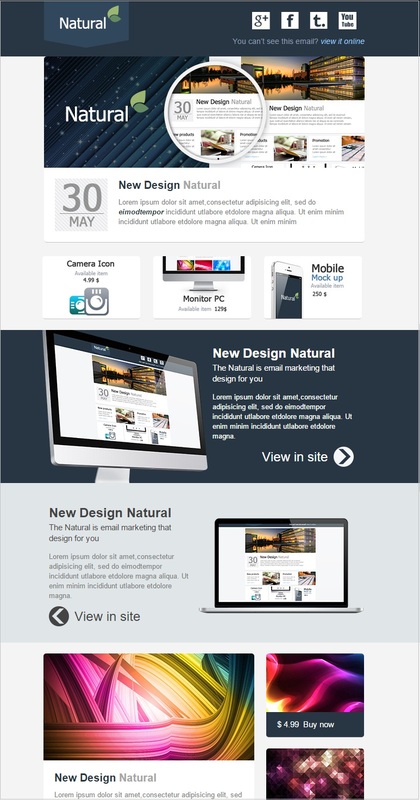 Natural is a responsive newsletter email template. The design is colorful, clean, smart and modern. There are 11 layouts , 2 background colors and 37 HTML files. Use the template builder to build your unique stylish template. The option of drag and drop module helps you to add, remove various sections. The template is compatible with various providers of email service – MailChimp, iContant, Campaign Monitor etc. Natural is compatible across various email clients. Quinn is a premium responsive email template. It is an ideal template to be used as newsletter or showcasing products/services. Quinn is clean minimalist looking template. It has two layouts – Boxed and full width. There are 14 different modules and 6 color options to choose. You can edit the template with template builder – StampReady Builder. The template is compatible with MailChimp,Campaign Monitor , My Mail, FreshMail. Frontier is premium email package. It contains 1 full responsive email template and 10 responsive notification templates. These templates are customized by themebuilder . Themebuilder is also provided in the package via link. You can change colors, layouts , background etc. The drag and drop feature allows you to easily edit the template. Frontier is compatible with email service providers- MailChimp, iContact, Campaign Monitor etc. It is also compatible with various email clients. The template uses Premium Proxima Nova font.